Coverage Area: Stewartstown Borough, Cross Roads Borough, Hopewell Township, East Hopewell Township and parts of North Hopewell Township south of Winterstown. Over 12,500 citizens and 72 square miles. Mostly rural, some commercial and light industrial.Staffing: Volunteers, full time, part time and contracted EMT&apos;s from Memorial Hospital. All providers must pass the rigorous state certification process in addition to continuing education requirements to maintain certification. Some of our EMT&apos;s are also instructors for the state EMT program, Red Cross and American Heart Association. They give a lot of their time teaching the community and other providers the Emergency Responder program, CPR, AED, bloodborne pathogens protection, driver training, and other topics of importance. This division is led by a paid EMS Manager who reports to the volunteer EMS Committee. This committee works closely with the local municipalities to ensure adequate EMS coverage. We staff one full ambulance crew around the clock with either paid or volunteer or a combination of both. 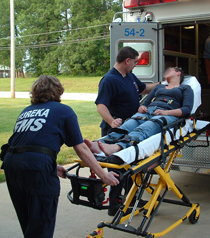 A qualified crew includes at least one EMT and one Emergency Responder/Driver (as certified by the American Red Cross or PA Department of Health). Our second ambulance is staffed by volunteers as needed. If you are interested in becoming an EMT or Emergency Responder, contact our EMS Manager or ask to speak to an EMS Training Officer. We will reimburse your for your ER or EMT training if you make a small committment to volunteer for our service. All you need to provide is your drive and dedication to help your family, friends and neighbors in the worst hours of need. Both of our ambulances are fairly new (2006 and 2010) and both are equipped with the latest technology such as Stryker PowerPro Lift Litters (electric lift up to 700lbs), Medtronic LifePak 1000 AEDs, and Stryker Stair Chairs. Our providers pride themselves on being the most professional and compassionate EMS crews around. Join our team today and help make a difference in someone&apos;s life.